This French fishing lake is close to the village of Meillant in Central France. The nearest big town is St Amand Montond which is about 130 miles south of Paris. 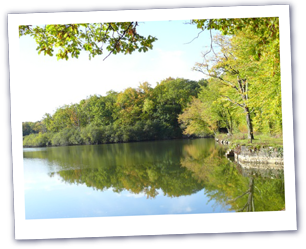 The lake is about twenty odd acres and set in beautiful mature deciduous woodland on the Chateaux Meillant Estate. The lake is reached by a good stone track from the road about half a mile away. In my experience it is one of the few places that you can sit and hear absolutely nothing but natural sounds. At night there is no light pollution and the sky is so clear that you can usually see the satellites sliding noiselessly overhead. Lake Meillant is roughly in the shape of a blunt ‘Y’. At the bottom end the lake is dammed and would be about twelve to eighteen feet deep right in front of the outflow. The main body of the lake is ten to twelve feet deep, shallowing up the nearer one gets to the top of the lake. The right arm shallows up to nothing and is a very exciting place to hook a big fish, the bow wave has to be seen to be believed! The left arm runs up to a culvert which enters into a smaller pond of about four acres. The water running into the lake enters this pond at the top and fish love to get in there. Ignore it at your peril! The trees grow right down to the water and the swims are a mix of conventional bank side swims and large wooded platforms that enable you good access to the water where the bushes get right into the water. 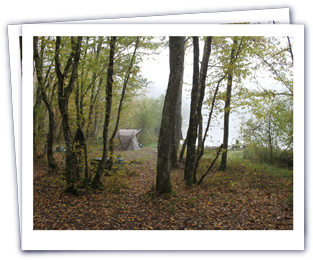 The platforms are large enough to put your bivvy on. On the dam is a wooden cabin, which we used to use as a base for anglers but given the standard of kit carp anglers take with them these days, we now regard as nothing more than a good store. But on a wet day, it could be a saving grace. Behind the shed is the toilet house. We are so far from the nearest services that we have no main water on site and so the loo is flushed with a bucket of water from the lake. The system works well! But what of the fish? The lake is principally managed as a carp fishery and there is a large head of commons and mirrors. The biggest we have reported is 58.5lbs which I confidently expect to make sixty pounds shortly. There are plenty of forties and several different fifties. But this is not a lake where you are going to wait all week for a run. Behind these monsters, there are plenty of twenties and thirties coming through to provide regular sport. In addition to carp, there are 20-30 grass carp, which are growing very big but for some reason rarely get caught, a couple of bright orange koi to brighten your day and some Wels Catfish. The cats are not very numerous but can be caught if you set your stall out to catch them and the biggest is pretty massive. We guestimate it at about 135lbs but if truth be told, on the odd occasion it is landed, carp anglers don’t have the kit to sensibly weigh a fish the size of a small shark! There are no silver fish or anything else to compete with the carp in the lake. 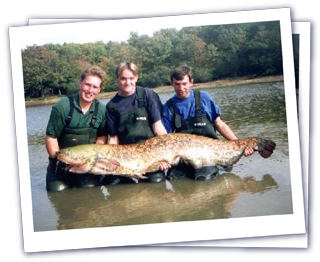 The lake lends itself to all styles of fishing including wading around in the shallows stalking individual carp – just like the old days! We recently wrote to all our guests asking what we should do to improve the fishery and the overwhelming response was ‘change nothing!’ Given that over 90% of the anglers fishing this lake are repeat bookings you will get the idea that this lake really is something very special. Be assured though, that we will continue to develop the fishery and try our utmost to make it even better! Lake Meillant is on the estate of Chateaux Meillant. The Chateaux is of great historical interest in France and attracts large numbers visitors every summer. It was built in the 12OO’s and has been in the same family ever since. When the aristocracy were used to demonstrate the effectiveness of the guillotine during the revolution, the People’s Army came for the owners and were repulsed by the locals who considered the owner to be a good chap who had looked after them well. One result of this lucky escape is that the Chateaux wasn’t looted and contains unbelievable collection of antiques and furniture which is one of the reasons it remains so important. There are guided tours around the house and it is well worth visiting. For prices and availability for Lake Meillant, follow the prices link.